Bask in the solitude of nature on rare private lot w/an abundance of oak trees, natural boulders, yr round creek. KIT w/Cherry finish maple cabs, gas cooktop, granite countertops, Cherry wood flooring, pantry & built-in refrig. FAM RM is located adjacent to KIT w/a stone wood burning fireplace, floor to ceiling windows & beamed ceiling. 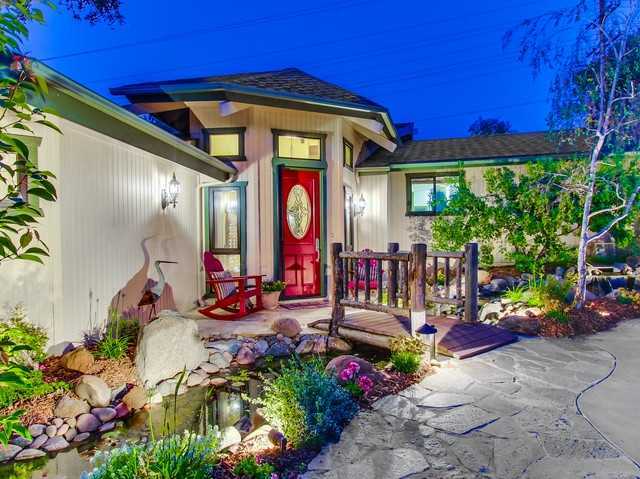 MBR has beamed vaulted ceiling, slider door to patio w/above ground private hot tub. MBR closet w/custom built-ins, MBA w/lg shower & jet tub. 2nd GAR w/drive thru doors.